Massachussetts Institute of technology students launch a sounding balloon. These students DID follow FAA guidelines, unlike many (Credits: 1337arts). There is little doubt that we are witnessing the birth of a new age in space utilization, an age principally characterized by increased space access and commercialization. For the most part, space aficionados everywhere applaud such change; but as with any evolution, there are a few growing pains starting to sprout. Two particular issues bear directly on the matter of safety, stemming from the increasing use of weather balloons and nanosatellites for DIY projects. 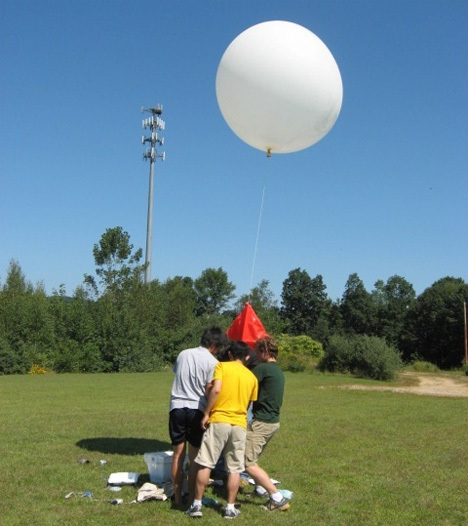 There have been increasing numbers of weather balloon projects in recent years, mainly by students in their high school years. These projects are exciting in that they propel young people to get involved in STEM disciplines and inspire others to follow them. Kids have launched their favorite toys, models, and phones and achieved glory in the so doing. But with the technology now so readily available, many don’t realize that weather balloons can be dangerous, principally to passing aircraft. Weather agencies and others who frequently use weather balloons don’t just shoot them off willy-nilly; they have to register each flight to be sure the airspace will be clear. Airspace monitors are becoming increasingly concerned – and frustrated – with amateur weather ballooners naivete in this regard, and the resultant close calls. Nanosatellites, though not quite so accessible as weather balloons, are still proliferating. Easier access to launch vehicles and standardization of Cubesat hardware makes it easier than ever to build your own satellite and put it in orbit. While this is great fun – who wouldn’t want their own satellite? – the fact of the matter is that space is crowded. We have a growing space debris problem of our own making, and while inspiring a lifelong love of science and technology, exploration and wonder, is a fabulous educational goal, the fact remains that we can’t really afford superficial satellites banging around when the ones we really need are already endangered. 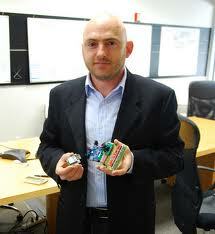 NanoSatisfi’s CEO Peter Platzer demos a model of ArduSat (Credits: NanoSatisfi). How to solve this conundrum without cutting off the promise of space access that has so recently opened? One solution has been offered up by NanoSatisfi. The not-quite one year old startup is built on the premise of making space accessible to everyone, but they went about it in a different way. What if, they said, everyone could share a single Cubesat? Students and amateurs, researchers and even governments, anyone can rent time on NanoSatisfi’s CubeSat. Suddenly, hundreds of space DIYers can DIY without putting a hundred hunks of metal up in orbit. Now, they just DIY by programming an open source satellite – named ArduSat – to maneuver and measure what and when they want. Rent the satellite time, and receive the data in your email, nothing simpler. The idea sounds so obvious that it seems startling that someone hasn’t done it yet. But the first satellite rental time will be available this summer, after ArduSat-1 launches by way of NanoRacks to the International Space Station and is booted off to orbit on its own. There are already hundreds of people who have booked time on ArduSat, and investors are seeing the promise of more to come. With suddenly easy and affordable access to this orbiting window, some people are suddenly faced with the question of what to do with it. What would you watch or measure or photograph with free license to use a satellite however you wish? Never fear, NanoSatisfi isn’t leaving their customers to their own devices. The company has launched what promises to be the first of many ArduSat Academy programs. The first sessions will run this summer and aim, in four weeks, to teach participants everything they need to know to make use of this new availability. The program, open to anyone 13 years or older, is slated to include lessons on spacecraft operations, functioning of ArduSat’s more than twenty five sensors, Arduino programming to control the sensors, and introduction to the science, experiments, and entertainment that can be achieved by harnessing them. To be held at NanoSatisfi’s headquarters in San Francisco, Academy participants will be able to test their programs on site and get feedback from the engineers who designed the satellite, its ground stations, and assorted infrastructure. Satellite sharing is not just for amateurs and has long time application in dual-use satellites – those with both commercial and military customers. But such partnerships might have something to learn from Nanosatisfi, who can accommodate up to ten users at a time. A recent study showed that in the US, more than $1 billion of satellite capacity leased by the government on commercial satellites simply idles away, going to waste. So, whether you’re a DIY type building rockets in your garage or a government agency dealing with a slashed budget, satellite sharing a la NanoSatisfi might be in your future. Disclosure: Space Safety Magazine’s managing editor was recently inspired by the NanoSatisfi initiative and has now joined the cause. Attendees of the ArduSat Academy Summer Program 2013 will find her in residence in San Francisco as program director. She hopes to find Space Safety Magazine readers there.